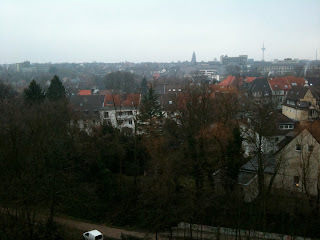 Foodies in the Czech Republic, 2010-2011: Essen in Essen, Germany (To eat in Essen, Germany)! 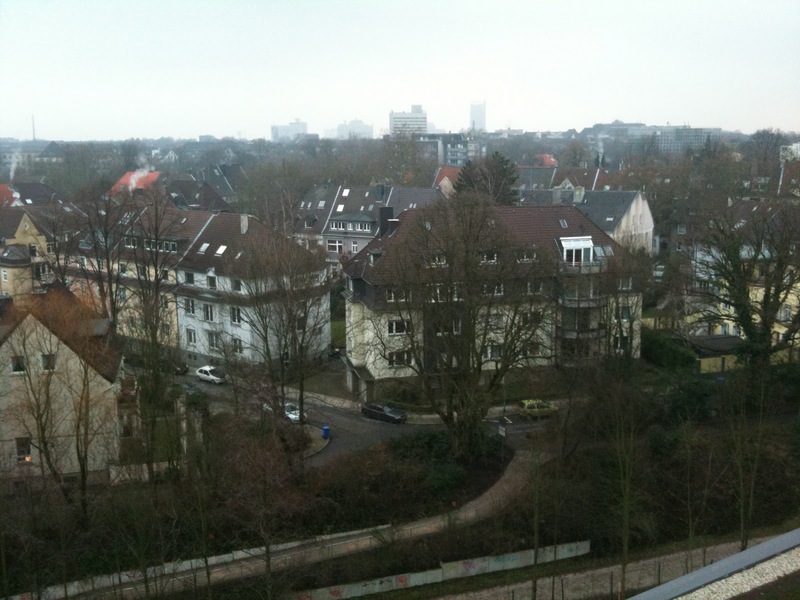 Essen in Essen, Germany (To eat in Essen, Germany)! Well, here we are in Essen, Germany (25-28 January 2011) to attend the Essen IPM Conference of floriculture, greenhouse, nursery, and floral design extravaganza! It is a world-famous conference; Neil had always wanted to head to Essen but never had the time. This year, since we're here in central Europe and had the opportunity to visit with many important industry contacts for Neil's work....off we went! We arrived here via train, as we didn't want to drive through snowy Austria and southeastern Germany (Bavaria) on the long trek to northwestern Germany (near The Netherlands and Belgium). We arrived via train late at night, passing the Conference Hall (Messe Essen) and onwards to our hotel (The Atlantic Congress Hotel) for the week. 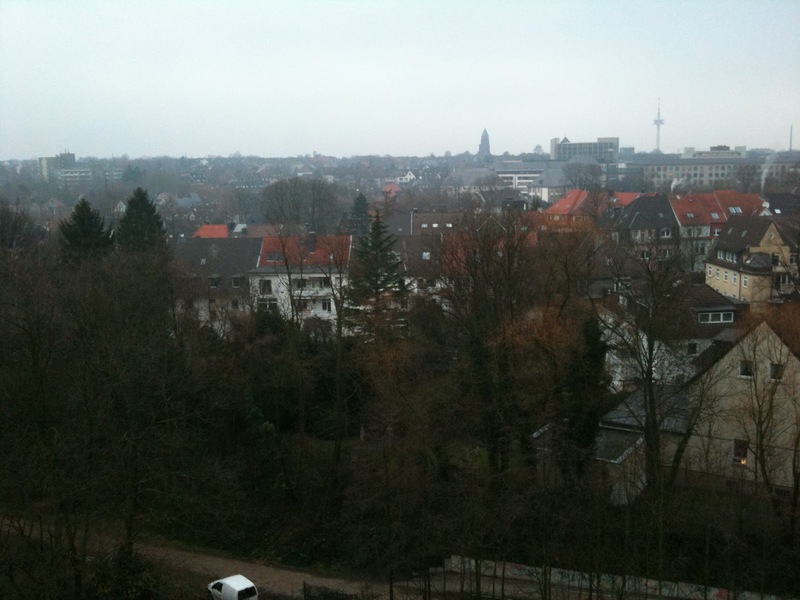 For those of you who may not know, Essen Germany, was one of the industrial powerhouses of the Third Reich. the Allies bombed it severely during WWII, nearly annihilating the entire city. So the city is now new construction (post-1945) and not at all like other cities with at least the cathedrals standing! It is still an industrial city, but one that is decidedly newer. Nonetheless, it is a great destination for looking at horticulture (our intentions), as well as eating, since the city's name is the verb meaning 'to eat'. And, one should note that Essen was home to the Krupps family--noted industrialists--from whose name the Krupps coffee makers also hail. The weather was superb: 10-12C and the Forsythia were in full flower outdoors! Of course, we're near to the coast...with the Netherlands just to the west and no mountain ranges to stop the warm coastal air from drifting our way. It was so pleasant to shed snow for 1 week (you should try it!)! We ate at numerous fares around the town, including Egyptian, Chinese, modern German fusion, and of course traditional German. Also, we delighted in visiting the grocery stores, as one never knows what they'll find. Here we found what we have never found in the Czech Republic (other Fulbrighters report the same thing): fresh cilantro (coriander)! We had to bring several boxes of that home for later culinary favorites, of course! The first night we tried the CUXX Restaurant, located in the Atlantic Congress Hotel. We had free breakfasts there every morning (superb, of course) so thought we'd try the evening meal here before venturing out the rest of the week. Here, Neil dines on their fresh-roasted lamb shank. What was so unusual about this one was the use of fresh leeks in the dish. The end of the bone is stuffed with a fresh leek leaf (festive), and the thin slivers of white, basal leeks are used as a garnish. It added a great lift to the deep, intense lamb flavors. We have liked the use of chopped fresh leeks; in the Czech Republic one can often find open-faced sandwiches with a garnish of fresh leeks. Use them sparingly, as they're a bit more 'oniony' in flavor than scallions! 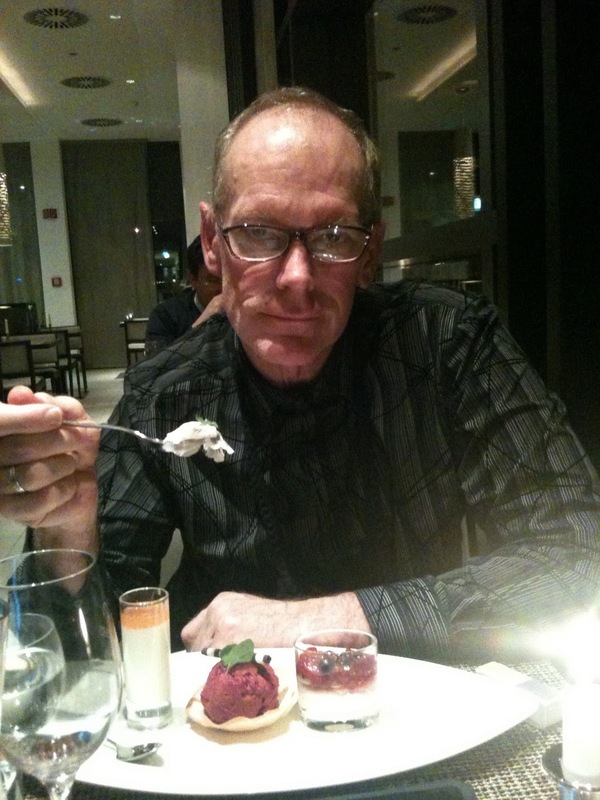 Mark dined on fresh fish that night, as they had several in the offerings that were unusually tantalizing. Then, it was on to desserts... Mark choosing the trinity of vanilla and chocolate mousse garnished with a pansy flower. 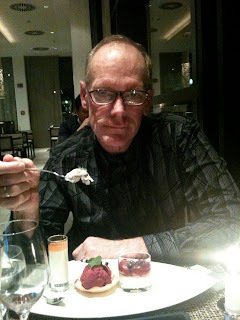 The center dessert was a crisp vanilla cookie topped with a scoop of handmade raspberry sorbet with lime, a garnish of mint, and hand-rolled chocolate sticks. Then followed by a dish of poached blueberries, black currants and cherries, with aromas of Grand Marnier mingling throughout. Mark does seem to enjoy the Trinity. Who wouldn't?! Neil chose the duo of a thin chocolate wall filled with pomegranate and raspberry sorbet, topped with fresh black currants and mint, along with the chocolate sticks. Then, on to the white chocolate mousse with hints of coconut and lemon, topped with another fresh pansy flower.